On the 18th and 19th September I attended a two day bearmaking course, taught by the wonderful Linda Benson and hosted by Bill and Jean Ashburner of BearBits fame. The two days were full on and packed with plenty of techniques and tips that were new to me and should help me to improve and extend the way I work. Jean and Bill were very hospitable hosts and great fun. They provided delicious lunches and kept us plied with refreshments. I have always adored Linda's work, so the opportunity to spend two days learning from her was an opportunity not to be missed! I still haven't quite finished my bear as I have some bearmaking commitments and deadlines to meet...so my little bear will have to sit and wait for time to finish. 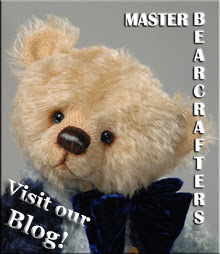 It was really lovely to spend the weekend with others that share the same bearmaking passion! 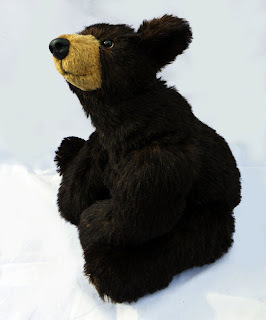 Teddybuys bears have been shortlisted in this year's competition in two categories: Blossom in Realistic Designs and 'I need a hug', otherwise known as Magic and Socks in the Group of Bears over six inches categories. So they are all looking forward to a day out at the finals at the British Bear Fair located at Brighton racecourse on Sunday, the 12th December. I travelled up to Kensington via the High Speed train from Kent to visit Hugglets on Sunday. Had a lovely pub lunch with the long-suffering other half and headed into the Halls. As usual, there was a sufeit of fabulous bears. I only managed to see 3 of Paula's (All Bear) bears as the others were sold, but they were just wonderful. There is no doubt that although photos are great, there is no substitution for holding the bears yourself. I had a chat with Marjan Jorritsma of Tonnibears (another of my favourite artists). Her bears have such a lovely, gently aged appearance to them and she had brought with her some absolutely charming little prim dogs. I must have one soon! I also managed a good hug from one of Dawn's (Hugs Unlimited) bears. He was very hard to put down...just like holding a baby and just as appealing. So many other wonderful artists...I could go on forever! 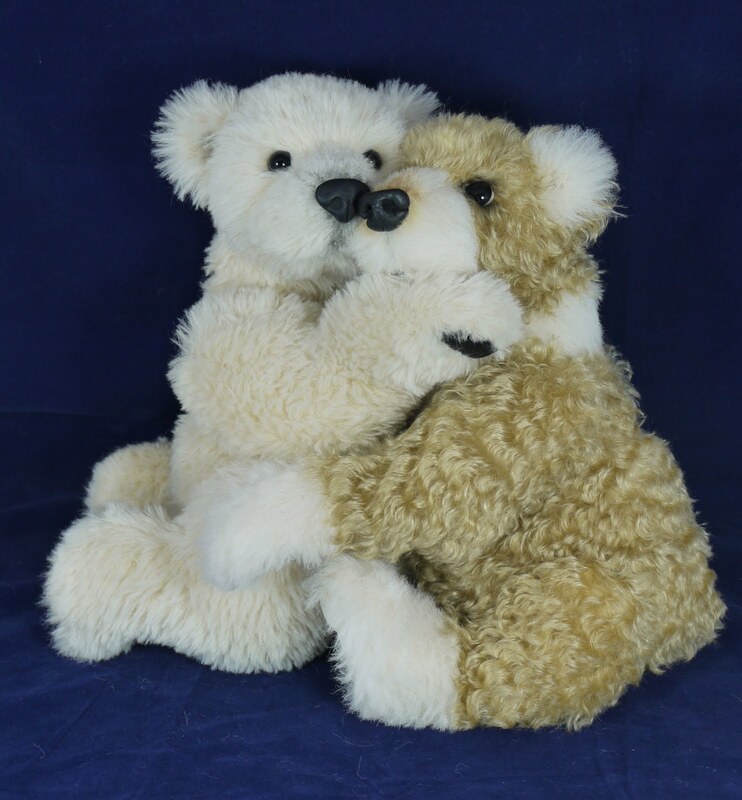 I picked up a couple of lovely pieces of ivory pure silk plush fabric from the Japan Bear Co. I will need to think carefully about how best to use them...possibly another polar bear??? 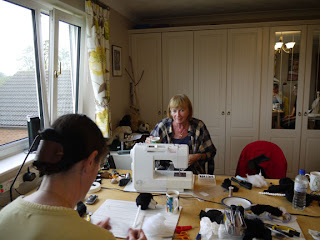 I am off to Lincolnshire on Friday evening for a weekend ourse with the wonderful Linda Benson. I said hi to her at Hugglets and had the opportunity to see the bear we will be making. Can't wait but also feeling some trepidation. Hope I will be able to keep up and not make a hash of my bear. I have done the pre-sewing and hope to produce a sequence of photos of my progress. The kit has arrived from Jean and Bill Ashburner. 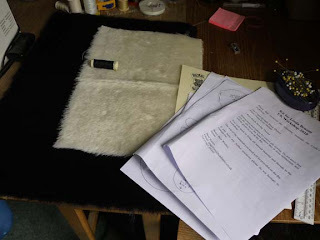 Just beautiful shiny black and ivory mohair. 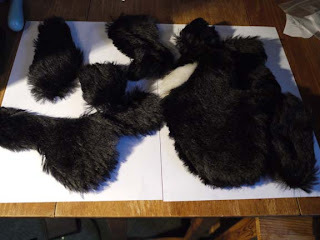 I have carefully cut out the pattern and completed the presewing. No head yet! 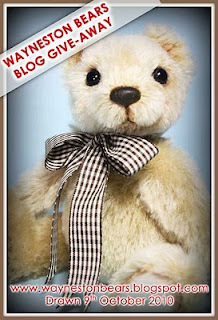 Gorgeous bear Giveaway, by Wayne Lim ! Click the image below and follow the instructions to give yourself a chance of winning this lovely bear! I hope it's me! My new workroom has space to store and work and best of all...I don't have to keep moving things at the end of each bearmaking session. At the moment, most of my materials are in a large old Victorian wardrobe, but I hope eventually to get something more suitable. 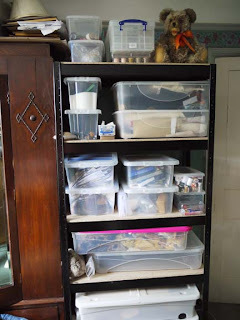 I am really pleased with the functional shelves in the photo. They were £50 from Argos and are extremely sturdy, so a great buy. 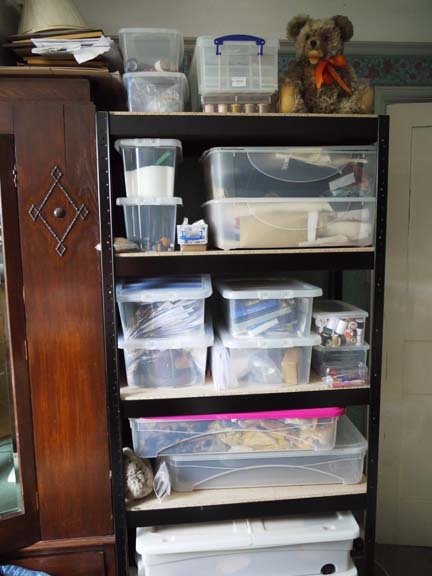 I also bought a large filing cabinet (also a bargain, as it was a second) which now houses my patterns etc. 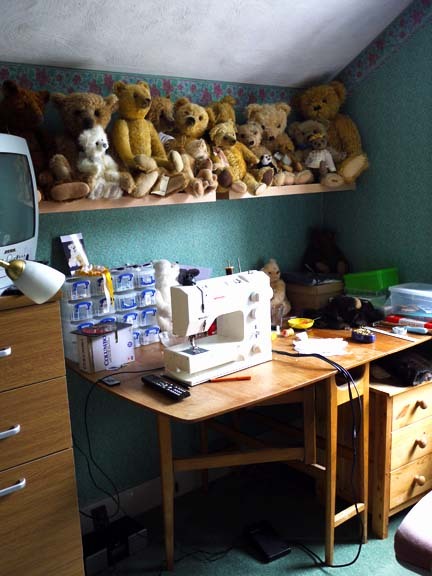 It's lovely to have my own space for my bears. It feels all cosy and the dogs snooze by my feet. I can shut myself away and forget about everything else!